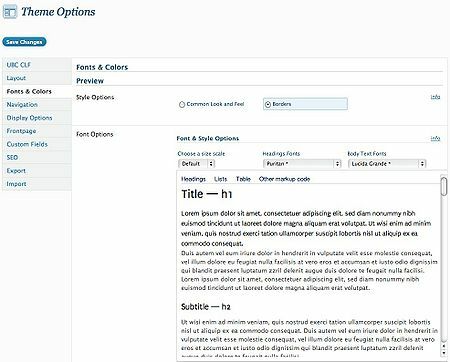 To customize the fonts and colors for your site in the WordPress UBC CLF Advanced theme, go to Dashboard and click on Appearance > Theme Options > Fonts & Colors. The Fonts & Colors section has the following sub-sections: Style Options, Font Options, and Colour Options. The Style Options allow you to change the presentation of your content. There are two styles currently available: Common Look and Feel, and Borders. Experiment with each option to find your preference. The Font Options section allows you to choose from a multitude of different font size scales, header fonts, and body text fonts. NOTE: Fonts marked with an asterisk character ( * ) are cross operating system compatible. The text box, found below the options, displays a preview of all the selected Font Options selections. The Colour Options section allows you to set your site to the default Vancouver or Okanagan colours. If you wish to choose custom colours, you can also manually set the primary emphasis, secondary emphasis and alternate background colours to match your unit's brand. Below each colour option is a description of what each option affects. If you wish to revert to the default UBC Vancouver or UBC Okanagan colours, simply click on the links called revert to UBC Vancouver colours or revert to UBC Okanagan colours respectively.